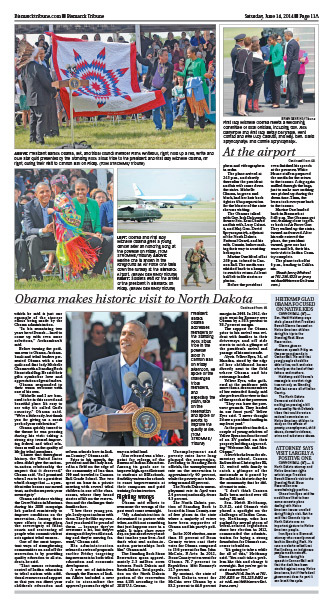 Obama’s North Dakota visit…where did he go? It’s interesting. A few Fridays ago, “the Preezy” came to North Dakota. In case you missed it, North Dakota at that time had had the lowest unemployment rate in the nation for 65 consecutive months at 2.6%. We have prospering energy, agriculture, manufacturing, and even tourism sectors…examples of things going right. The President didn’t visit the Energy Corridor, any of our so-called Centers of Excellence, or an agricultural landmark such as a farm or co-op. So where did he go? The Community Organizer in Chief instead did what community organizers do best: he went to a part of the state that admits 60 percent unemployment and 40 percent poverty, speaking in broad platitudes and offering no solutions, then hopping back on his jet to head for a $32,000 per plate fundraiser in another state. By the way, life on “the rez” is a perfect example of what happens if you let the federal government intrude upon all aspectsof your life. This is the liberal Democrat utopia in full effect. Think I’m wrong? Look at other bastions of Democrat Party liberalism such as Detroit, which has deteriorated from a bustling metropolis and center of ingenuity & industry into a scene from Sarajevo or Tikrit. The example doesn’t end there. In fact, the native peoples have had “single payer health care” provided by the federal government for a long, long time. You know what the credo is for people in the Indian Health Service system? “Don’t get sick after June.” The money simply runs out, and treatment is unable to continue. Welcome to another Democrat utopia. Never has there been a more perfect microcosm to demonstrate where the United States will be if Hope™ and Change™ are allowed to reach fruition. Native people deserve more, the way they’ve been treated over the years is an embarrassment to our nation, and it’s sickening to use them as props. The scary thing is, instead of helping them, this president and his party want to expand their plight to the rest of the nation…”equally”. 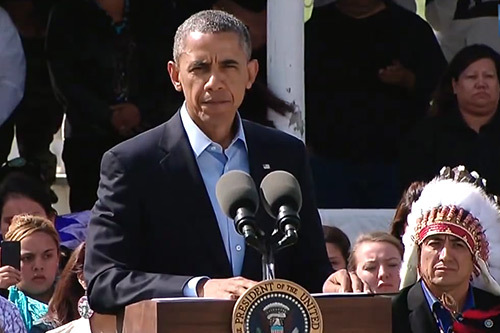 By the way, Chase Iron Eyes dared to make a comment about he would have actually liked to have seen some “concrete plan” from the president…but he got nothing but platitudes and other community organizer rhetoric. You won’t see that comment on the Bismarck Tribune website anymore, because the article has been scrubbed from the Tribune website. Here’s a PDF of the article before it disappeared. So, instead of visiting North Dakota’s “energy corridor” to see how land is mined then reclaimed, or how oil is recovered while flaring is reduced, or how North Dakota farmers are feeding the world, he instead went to a place where poverty and misery run rampant because of government policies and dependency upon myriad social programs…and did the one thing he does best: sowing discord while offering no solution. That is not leadership. No wonder more people were excited about seeing the plane than the president occupying it. Can you blame them?